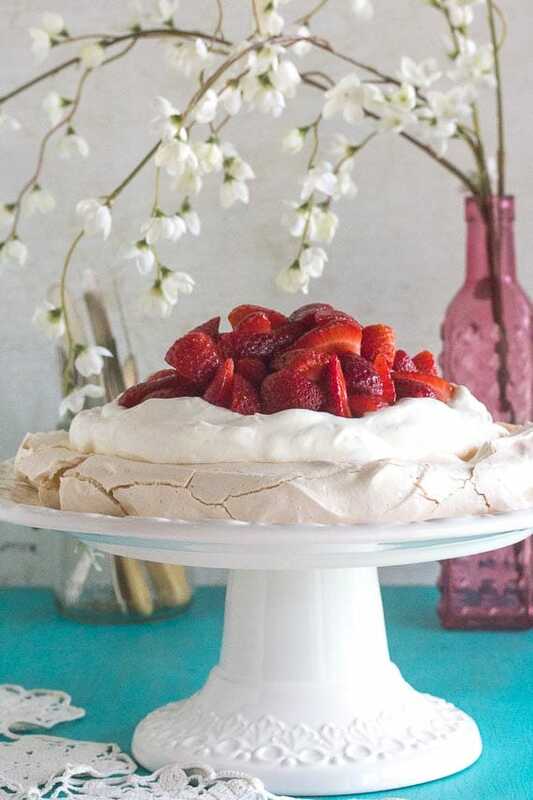 Pavlova is a dessert steeped in history and our low FODMAP recipe for Strawberry Pavlova is an exemplary version (if we say so ourselves). The combination of sweet crunchy meringue, silky whipped cream and fresh fruit will always be welcomed. In the mid-1920s, Russian ballerina Anna Pavlova toured Australia and New Zealand and made such an impression that a namesake dessert began appearing in restaurants. 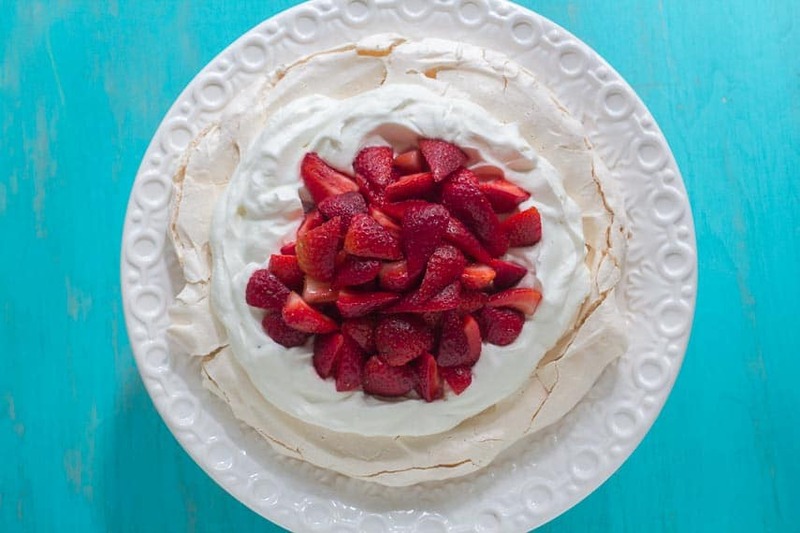 It is a slightly chewy meringue round topped with cream and fruit, usually served as one large dessert to be divided among diners. The original was said to be as light and airy as the dancer’s quality of movement. The meringue was meant to mimic the shape of her tutu, the cream was reminiscent of its lacy frills, and the original fruit used, kiwi, was supposed to represent the green silk roses on her costume. Our version of Strawberry Pavlova sticks close to the original. 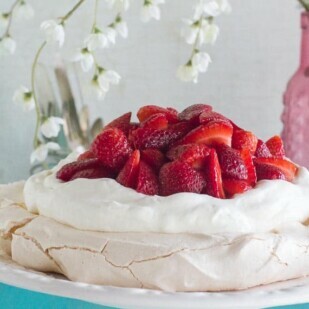 The meringue disc contains egg whites and sugar, of course, but also contains the common Pavlova additions of cornstarch and vinegar. The aim after baking in a low oven is to have a crunchy exterior and a slightly chewy interior. The whipped cream remains lightly sweetened because the meringue is sweet enough. The fresh fruit – strawberries in our case – are featured both for their free-from detectable FODMAP status and also for their brilliant color and luscious juiciness. Make this when berries are at their best for a dinner party – or even as a birthday “cake” or other celebratory dessert. It makes a splash presented on a pedestal, in all its glory. For another take on this classic, try our Marbled Chocolate Pavlova! 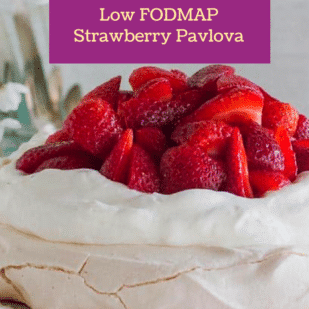 Low FODMAP strawberry Pavlova makes a perfect special occasion dessert. Make sure to use deep red, sweet berries for best results. For the Meringue: Preheat oven to 350°F/180°C. Line a baking sheet pan with parchment paper and trace a 9-inch (23 cm) circle on the paper; flip paper over. In a clean, grease-free bowl whip egg whites with balloon whip attachment of stand mixer or use an electric beater on low speed until frothy. Add cream of tartar and continue beating, turning speed to high, until soft peaks form. Add sugar gradually and beat until meringue is stiff and glossy, which will take several minutes. Beat in cornstarch, vinegar and vanilla. Scoop meringue onto parchment within the circle and use the back of a large spoon to help shape a round disc; use the drawn circle as a guide for the outer edge. Make a slight depression in the center of the disc. (Use photo to aid you here. You will be piling the whipped cream and berries in the middle and a depression in the meringue will help hold the toppings). Place in oven and immediately turn oven down to 250°F/121°C. Bake for 1 hour, then check the meringue disc. It should be crisp, dry and just tinged with a faint amount of color. Turn off oven and allow disc to cool in oven. Once cooled, disc may be stored in an airtight container at room temperature for up to 3 days. (You would need a large, wide, flat container, so plan ahead if you want to do this). For the Toppings: Right before serving (or within 30 minutes) place strawberries in a bowl with 2 teaspoons of sugar and a few drops of both lemon juice and vanilla extract. Fold together well and allow to stand while you whip the cream. Whip the cream in a chilled bowl with remaining 1 teaspoon sugar until soft peaks form. Place meringue disc on flat display platter. Pile the whipped cream in the center of the meringue, allowing an edge of meringue to remain (use photos for guidance). 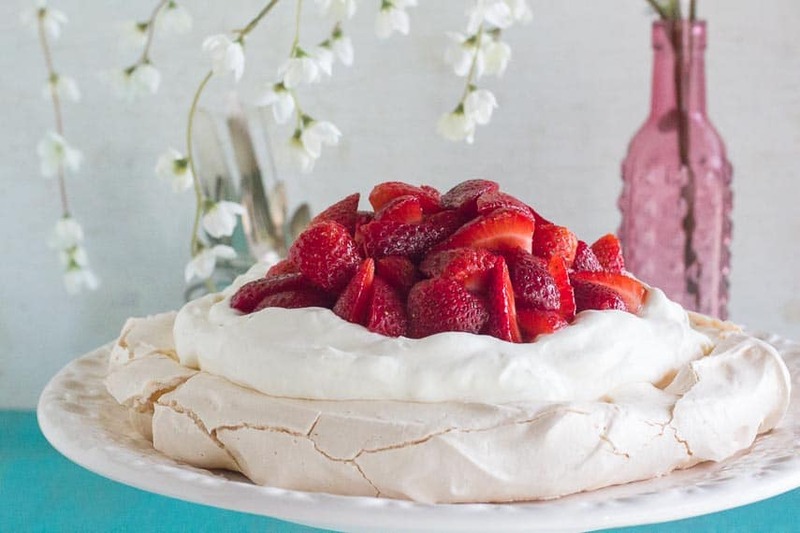 Place berries on top of whipped cream and serve in wedges - which will be slightly messy as you try to cut into the Pavlova, but trust me, I have never had anyone complain! Spoons work better than forks for this dessert.